We all know the feeling…you’re heading out the door to work early in the morning and you catch that heartbreaking glance from your pup as if to say “When are you coming home?” We all hate to leave our best friends by themselves while we head out to take care of business, mostly because we know they’re at their happiest with us! 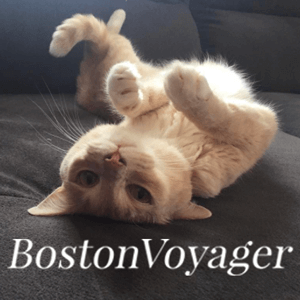 Unfortunately we can’t possibly give our four-legged friends the round-the-clock attention they so deserve (gotta pay for those treats and toys somehow! ), so what options are we left with? 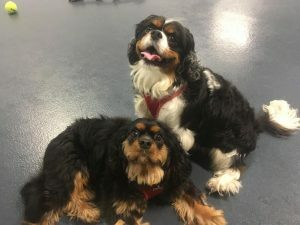 Dog daycare is an increasingly popular choice for busy parents who want to provide their pup the attention, exercise and socialization they can’t while at work. If you’re wondering whether doggie daycare is a good fit for your pup, there are numerous benefits and advantages to consider; all of which result in a happier, less anxious and healthier dog for you to come home to! Let’s explore some of those benefits so that you can make an informed decision in getting your pup to some much deserved weekday playtime at Elliot’s House! 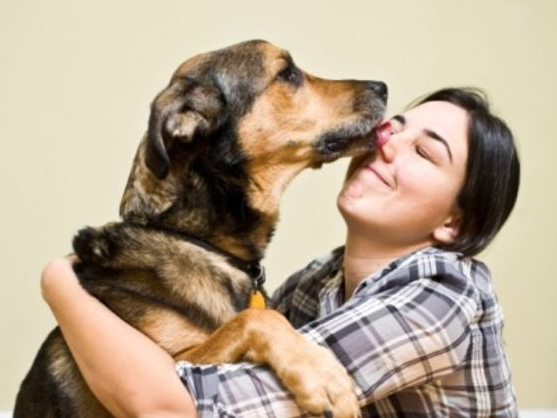 While no one can replace the special bond you have with your pup, forming a positive and caring relationship with other people trained to provide a stimulating, safe and fun environment is a definite plus. Expanding the circle of people your dog interacts with on a daily basis helps them to become more well-adjusted and social; making meeting new people less stressful going forward. Work is stressful enough without having to worry about your pup restless at home, so give yourself some peace of mind knowing they’re in the care of dog lovers just like you! 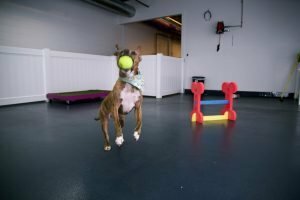 Whether you have a rambunctious new puppy or an older more reserved dog, daycare provides a unique monitored environment for pup socialization. Younger pups can learn social skills and boundaries with a variety of other dogs, while older or otherwise anxious pups can learn to come out of their shell at a pace that’s comfortable to them. Daycare is a safe training ground for meeting and playing with new friends, so that those Saturday trips to the dog park can be more fun and less stressful for pup and parent alike! The same way people workout to reduce anxiety and restlessness, dogs need consistent activity and exercise to keep them from becoming antsy and possibly even destructive when left unattended at home. Behaviors such as chewing on your favorite leather couch or knocking over the kitchen garbage often come from lack of stimulation or separation anxiety; issues that can easily be resolved from running and playing for hours straight at daycare! There are few things cuter or more peaceful than a pup returned home exhausted from a long day of play with new friends! Overall, providing your dog with the opportunity to socialize, exercise and play while you’re at work will result in a happier, healthier pup for you to come home to. The Elliot’s House daycare facility has 4,000 square feet for your pup to roam and play while getting professional care and attention from our dedicated attendants. 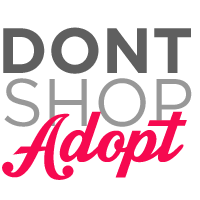 You can opt to drop off/pick up yourself, or have us provide transportation and drop off your pup happy and tired! We offer both single day and 10-50 day packs at a discounted rate if you plan on making daycare an everyday treat for your pup. To schedule your dog for daycare, head to https://www.elliotshouse.com/dog-day-care/ and get your pup in for a full day of fun!